Head coach Thomas Christiansen was critical of his players after seeing Leeds United lose another Yorkshire derby as they went down 2-1 to Sheffield United at Elland Road. The Blades went top of the Sky Bet Championship with a victory that came courtesy of David Brooks’ first goal in senior football nine minutes from time. Former Leeds striker Billy Sharp had put the visitors ahead in only the second minute, but the Whites hit back with a fine Kalvin Phillips volley and were the better side after the break when Samuel Saiz hit the post. However, they were lucky to still be in at the break and Christiansen did not mince his words afterwards. He said: “I cannot be happy. At least one point would have been good, but we didn’t make a good performance. We have to honest with ourselves and the way we acted in the first half is not good enough. “We were still in the changing room when they scored the first goal and that’s the difference between this week and last week. Last week the team were focused from the first moment, including the warm-up. They had the feeling that something good was to come. “When you receive a goal in the first minutes, you cannot allow that. “It was a bad first half. We managed to come back into the game in the second half, but still it’s not good enough. A fifth defeat in seven cards looked on the cards for Leeds when they defended like statues to allow Sharp to steal in for a free header from close range to open the scoring in the second minute from Mark Duffy’s cross. Leon Clarke almost made it two in the ninth minute when stretching to reach a low cross and getting ahead of home defenders. Andy Lonergan made his first save to deny George Baldock’s 20-yard angled drive and the Whites simply had not started in the game with numerous errors as they struggled to build up any play. Sharp came close to doubling his tally with a near post shot after Matthew Pennington gave the ball away. 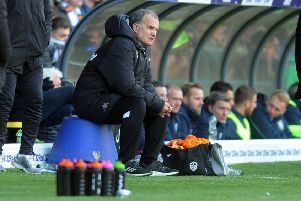 Leeds finally fashioned their first shot and amazingly they were level as Saiz came in from the left wing role he had been handed and put in a teasing cross for Pierre-Michel Lasogga. The striker could not get his head to it, but the clearance fell straight to Phillips who found the net with a well struck volley. Ronaldo Vieira hit a shot wide from distance as Leeds began to grow in confidence, but they were breathing a sigh of relief just before the break as the defence switched off from a free-kick and Sharp was clean through only to be denied by a fine Lonergan save. The Whites were better after the break, however, with Saiz now in a central role and beginning to influence the game. He was desperately unlucky when he hit the post with a curling left foot shot from the edge of the box and the ball then hit keeper Jamal Blackman, but still stayed out of the net. Within a minute Ezgjan Alioski hit a shot wide and Leeds were edging it now. A poor challenge by Phillips saw him booked and now suspended for picking up five yellow cards this season, although replays showed he was a little fortunate not to be sent-off. The Whites were back in attack soon after only for Alioski to send a weak header straight at Blackman after he got round the back to meet Saiz’s cross. But for all their huffing and puffing in the remainder they did not create another clear chance. The visitors were hardly an attacking force either, although Clarke saw a low shot saved by Lonergan then they came up with their winner in the 81st minute. Talented youngster Brooks, on as sub for Sharp, raced onto a through ball that caught right-back Luke Ayling out and came up with a calm finish to make it 2-1. That was how it stayed to the finish although tempers flared when Saiz took exception to Duffy taking his time going off after being substituted and pushed the player. Saiz was also pushed to the ground, but referee Scott Duncan, who had a good game, calmly dealt with the situation without producing any cards. Leeds: Lonergan, Ayling, Pennington, Cooper (Jansson 56), Anita (Grot 84), Alioski (Hernandez 70), O’Kane, Vieira, Phillips, Saiz, Lasogga. Sheffield United: Blackman, Baldock, Basham, Carter-Vickers, O’Connell, Coutts, Duffy (Lundstram 86), Fleck, Stevens, Clarke, Sharp (Brooks 75).